There are other types of cameras not present in the Editor. These camera types can be controlled by the code. Controls rendering of objects, decals, and lights into the camera's viewport. Controls rendering of the environment probe's and planar dynamic reflections into the camera's viewport. Specifies what sound channels are played for this camera. Specifies what reverberations are played for this camera. The camera's vertical field of view, in degrees. Focal length of the physically-based camera lens, in millimeters. Determines the area that can be seen in the camera's viewport. Horizontal size of the film gate for the physically-based camera with horizontal FOV, in millimeters. Determines the area that can be seen in the camera's viewport. 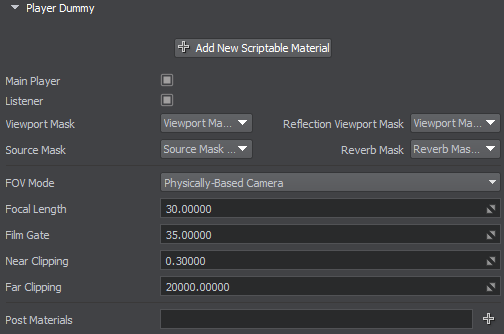 In the Post Materials parameter field, you can add postprocess materials to the camera. These materials will be applied after all other postprocesses (such as HDR, DOF, etc.) are applied. 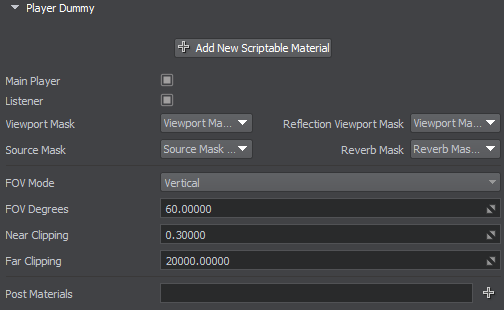 To add a postprocess material, click and select a material from the dialog window that opens. If you want to use several postprocess materials at the same time, separate their names by a comma with no whitespace, and these materials will be rendered in the order they are positioned in the field.